Lucknow: Shri Vijay Goel, Hon’ble Minister of State for Statistics and Programme Implementation & Parliamentary Affairs Government of India today visited Lucknow Metro, one of the most prestigious project of the Government of India and the Government of Uttar Pradesh and reviewed the progress of the project for the entire 23 km long North –South Corridor (Phase 1A) from Chaudhary Charan Singh Airport to Munshipulia. 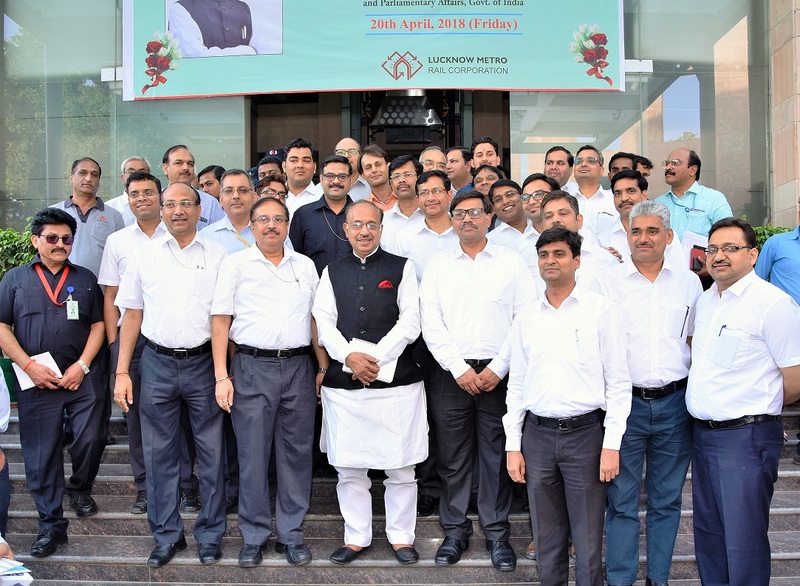 Shri Vijay Goel Hon’ble Minister arrived at the Administrative Building of Lucknow Metro Rail Corporation at 3.00 PM where he was welcomed by LMRC Directors and other senior officials. A presentation was also given to the Hon’ble Minister by Lucknow Metro Rail Corporation and NHAI during his visit. He reviewed the progress of the Metro work going on for the Hussainganj-Sachivalaya-Hazratganj section and the elevated section beyond K. D. Singh Babu Stadium upto Munshipulia. The Hon’ble Minister also briefed the media about the latest development and progress of the Lucknow Metro Rail Project. He expressed his overall satisfaction on the progress of the project under the leadership of the Managing Director and congratulated LMRC for providing ‘Metro’ to Lucknow in such a short span of three years.